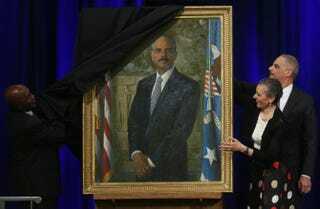 Attorney General Eric Holder (right) and his wife, Dr. Sharon Malone, help artist Simmie Knox (left) unveil Holder’s official portrait during a ceremony at the Justice Department Feb. 27, 2015, in Washington, D.C.
Called the “people’s attorney” by President Barack Obama, Eric Holder has made a lasting legacy in Washington, D.C., and not just by being the first African-American attorney general. As he prepares to step down, here’s a look back at some of his career highlights during his time as attorney general. Eric H. Holder was sworn in as the 82nd attorney general of the United States on Feb. 3, 2009, by Vice President Joe Biden, becoming the first African American to hold the position. Prior to his appointment, he worked as a senior legal adviser for then-Sen. Barack Obama’s presidential campaign and served as one of the members of Obama’s vice-presidential selection committee. Within months of taking office, Holder began reshaping the division, moving it away from the Bush-era focus on individual cases, to civil rights enforcement, zeroing in on policies that had disproportionately negative effects on minorities. “Fast and Furious” was a Justice Department sting operation intended to track the flow of gun sales from the U.S. to Mexican drug-trafficking organizations. After 1,400 guns went missing, two of which were found at the scene of a U.S. Border Patrol agent’s slaying in 2010, the operation was halted and Holder was questioned. President Obama used his executive privilege to shield Holder from providing sensitive documents to the House committee. Members then voted to hold Holder in contempt of Congress for obstructing the probe, making him the first attorney general to be held in criminal contempt. For Holder, enforcing the Voting Rights Act was a key priority. During President Obama’s first term, Holder oversaw several of the Justice Department’s successful voting-rights lawsuits. In 2012 the department used Section 5 of the Voting Rights Act to successfully block a strict voter-ID law in Texas, soften the South Carolina voter-ID law and stop cuts to early voting in Florida. The Justice Department seized two months’ worth of phone records from editors and reporters after the Associated Press published a story in 2012 claiming it was delayed in reporting on a terrorist plot in Yemen because of national-security concerns by government officials. Holder stated that he believed the article threatened American security and defended the Justice Department’s need to examine the correspondence, arguing that journalists do not enjoy a “reporter’s privilege” under the First Amendment. Wall Street: Too Big to Jail? Critics of Wall Street have slammed Holder for not prosecuting top executives during his tenure. Holder argued that it was too dangerous to impose harsh penalties on leaders of financial institutions because it would negatively affect the national economy. He told the Senate Judiciary Committee: “I am concerned that the size of some of these institutions becomes so large that it does become difficult to prosecute them.” After much criticism, he revised his statement, saying, “There is no such thing as ‘too big to jail.’ No individual or company, no matter how large or how profitable, is above the law.” The investigation resulted in only a handful of multibillion-dollar civil settlements and no jail time for top execs. As part of his “Smart on Crime” initiative, Holder announced that nonviolent, low-level drug offenders with no ties to gangs or drug organizations will no longer be charged with offenses that impose severe mandatory sentences. “Too many Americans go to too many prisons for far too long, and for no truly good law-enforcement reason,” Holder said. The U.S. Sentencing Commission voted unanimously in 2014 to reduce sentencing guidelines that could shorten prison stays for about 70 percent of federal drug-trafficking defendants. He has also called on states to repeal laws prohibiting felons from voting after their release from prison. Holder visited Ferguson, Mo., in August 2014 to be briefed on what many called an unprecedented federal civil rights investigation into the shooting death of Michael Brown. He met with Brown’s parents, local residents, law-enforcement officials and political leaders, promising a thorough investigation into the case. Many saw the iconic visit as Holder’s taking a strong personal interest in the Ferguson investigation. In June 2014, Holder announced that the Department of Justice was reviving its Domestic Terrorism Executive Committee. The group was created after the Oklahoma City bombing in 1995 to share information about domestic threats and was put on hold immediately following the Sept. 11 terrorist attacks to focus on terrorists abroad. Holder said that the recent deadly shootings at Fort Hood, Texas, and the Boston Marathon bombings demonstrate the danger of homegrown terror. Consisting of the Justice Department, FBI and federal prosecutors, the committee will coordinate with law enforcement nationwide to share pertinent information. Nicole L. Cvetnic is The Root’s multimedia editor and producer.